Oh my goodness. You know how sometimes after coming home from a long weekend you can end up with a vacation hangover? That feeling where you’d so much rather be where you left, like you can’t even stay awake because you played so hard? This trip left me with a happy hangover. Real quickly, though, the 10k was MUGGY. Oh man. My gills had dried up from last summer (thanks a lot, winter), so I could barely breathe. Five of us stopped right at the mile 6 mark so that we could wait for our friend Lo, who was running her very first 10k. The look on her face when she rounded that corner nearly made me cry! So we finished the race running in a pack around her (pretty sure she crossed the finish line before us), and what made it better was the number of people around us who started cheering for her too. Have you ever finished a race with tears in your eyes? I have. It was incredible. The half marathon was the slowest half marathon I’ve ever run (by an HOUR…and that’s counting the first half of the full last year). It was also the most fun half marathon I’ve ever run. SO. MANY. PICTURES. Not even kidding, we waited in line for over 15 minutes for the picture with Mickey and Minnie. And? It was worth every single second. I know that I didn’t ever put up a mile 19 dedication, but I’m ok with that. The last mile was a combination of exhaustion and sweat and a bit of pain and a whole lot of happiness. But for simplicity’s sake, I’ll dedicate it to Pop Chips, which I knew were waiting for me at the finish line. The rest of the time spent with five absolutely INCREDIBLE women before, during, and after these races made the whole weekend that much more special. I just….whew! I don’t really have words for how amazing they made this weekend. There are already plans in the works for future races and trips, and I couldn’t be happier about that. And of course, then there’s this. As this is posting, my dear friend Angela is getting on (or waiting to get on….or already on…I’ll be honest, I don’t remember anymore) a plane to head to Florida. She is going to be my partner in crime for 19.3 miles. Over the last year or so, Ange has turned from chatting buddy to confidant to running partner to dear friend. I cannot begin to fully express how much I appreciate all the encouragement that I’ve received from her over the last little bit, and couldn’t be happier that I get to share this whole weekend with her. T-minus 46 hours until we run together. So let me tell you about my friend Miranda. She and I met when we were both writing for Aerys (remember that hockey blog I had for a while?). I don’t know if I can pinpoint the moment where we started spending more time emailing back and forth than anything else, but hoo-boy, the emails. Guys? These emails get MONSTROUS. As in once my gmail TRUNCATED OUR EMAIL, and I had to open it in a new window because there were so many words. These emails and the contents therein brought into my life an absolutely incredible friend. She’s listened to me vent in more words than was probably necessary about my running and has encouraged me through every race no matter what. I have a folder in my gmail for motivational stuff. There are 120 emails in that folder. Every. Single. One of them came from Miranda. Seriously. She’s a motivational guru. Over the last little while, as is partially documented in this space, I have struggled mightily with running and training, etc. What you have seen here is but the slightest fraction of all I’ve written about it. Just instead of blogging, I’d email Miranda. There aren’t enough thank yous in the world to adequately appreciate every time she’s been there when I couldn’t seem to do anything but just….write. She’s encouraged and mentally pushed me. She’s thrown enough virtual glitter to get on Ke$ha’s nerves. And she made sure, in those less than stellar times, that I remembered why I do this. I remember why I do this. I am doing mile seventeen for her. Lately I have tried to keep much talk of GCB off of here. It has gotten to where once I start blathering on about him, it’s difficult to stop, and then this space turns into a sappy, goopy mess. I’ll spare you. When it comes to my running though, I have an incredibly solid support system, for which I am very grateful. A lot of times, it’s a lot of words connecting me to people, but not so with GCB. He is here to wipe away the tears I can’t stop when it’s been a rough run or when I’m frustrated and struggling. He’s here to help massage out super sore muscles. He’s the one who will come running with me, even if he’s already played hockey that day, just because it’s dark and I’d rather not go alone. He’s been convinced to run multiple races with me, and it’s never been the running as a cause of complaint (hey, broken toe during Tough Mudder). He also understands exactly how much I love running, as he feels the same way about hockey. He’s aware of what kind of endorphin boost it always gives me, and he doesn’t hesitate to shove me out the door when I’m waffling about going. I knew within a week of meeting him that he was going to be an important person in my life when he hung out on a half marathon course for nearly four hours with my best friend (who he’d never met) just so he could give me beer when I ran by and see me for not even two full minutes. His excitement about my races makes me more excited. He’s thrilled for me when I do well, and lets me be sad when I’m not so happy about things. I cannot imagine having anyone else by my side for every single adventure to come, running and otherwise. I am so stupidly lucky to have him. Mile sixteen is for him. I know I have already written about my family, but today I wanted to highlight just how awesome my mom is. She’s written a bunch in the past about some health issues that caused her to gain some weight. When she was finally able to start working out again, she started running. Couch to 5k, Couch to 10k. We talked frequently before she started these programs about how running just wasn’t for her but that she was going to try it. Back in October, my mom ran her very first 10k. And you know what she’s done since? Kept running. Kept signing up for races. Kept a more active lifestyle than most people my age. If I’m being perfectly honest, she’s run more this winter than I have, one time with plastic baggies around her feet so her toes wouldn’t get wet. She’s come so far from where she started, and that is quite the motivation to me. Mom, mile fifteen is for you. 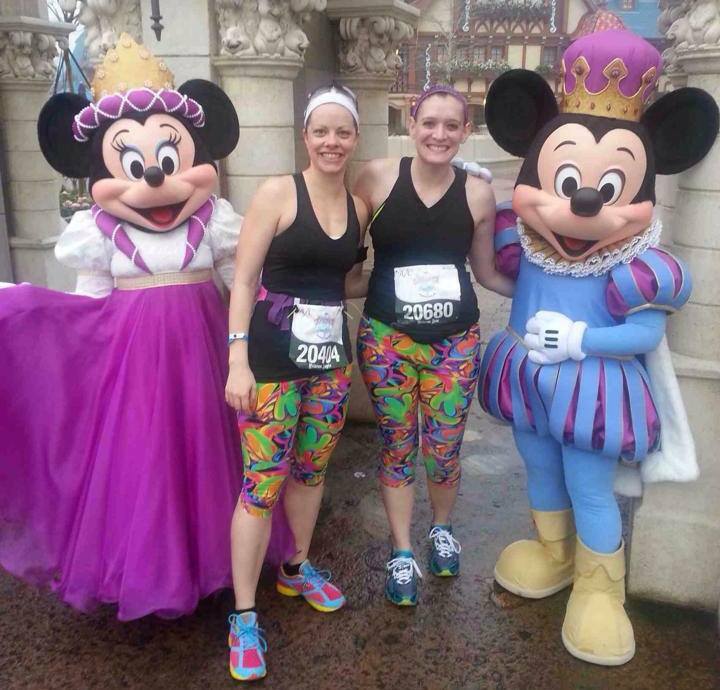 And for a bit of a flashback, mom’s very first 5k and my very first Disney race. We were pretty. With many of my dedications, I started just making a list of who I wanted to mention and plugged them into a post. This one, though, is rather particular. You see, Steph was the first and is to date the only person who has ever run fourteen miles with me. She’s also the one who learned with me just how much of a horrible idea running a full marathon on zero training is. Seriously awful, bad, no good idea. Don’t do it. 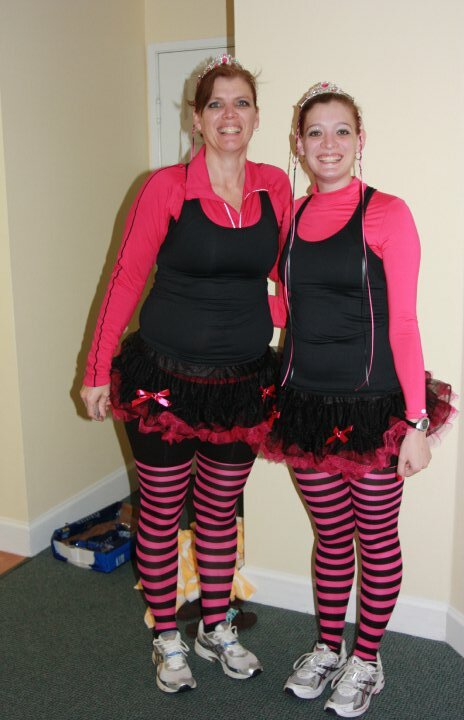 Our running lives have taken us in some vastly different directions (hers through another marathon, mine through a Tough Mudder), but there’s always been that common theme of being a runner. After Tough Mudder when it was time for me to refocus on running in just running races, she welcomed me back into the fold. And in just a couple months (or, you know, seven-ish weeks from now) we’ll be back on the same course, shooting for a repeat yet improved performance during the GO! St Louis half marathon, our very first race we ever ran together. I’m sure I won’t be the only one there who will be excited for the mile nine beers. Steph, mile fourteen is for you. See you soon. Let me tell you about my friend Heather. Quite a few people have called her my brain twin, and it isn’t abnormal for one of us to say, “Yeah, what she said.” I like that about her. Heather is someone that I email with daily, along with my Calgary running buddy Angela. Sometimes, obviously, the topic turns to running and specifics about races. And you know what? It doesn’t make Heather go crazy! She loves us nonetheless. I am thrilled that she is one of my friends, and I can’t wait until I’m able to give her hugs again. Heather, mile thirteen is for you.